Daw Aung San Suu Kyi is welcomed at the International Labour Organization Conference in Geneva. Highlighting the recent changes in Myanmar, Nobel laureate and pro-democracy leader Aung San Suu Kyi today invited international aid and investment to help build a better future for the south-east Asian nation, as she addressed a United Nations labour forum in Geneva. “Foreign direct investment that results in job-creation should be invited. Investors should adhere to codes of best practices. Track records in regards to internationally recognized labour standards and environmental responsibility should be examined,” Ms. Suu Kyi told delegates at the annual conference of the International Labour Organization (ILO). “What I would like to see for our country is democracy-friendly development growth. I would like to call for aid that would strengthen the democratization process by prompting social and economic progress that is beneficial to political reform,” she added. In April, Myanmar citizens headed to the polls to vote for representatives of 48 parliamentary seats, with Ms. Suu Kyi winning a position in the lower house of parliament. The by-elections were part of a series of democratic reforms led by President Thein Sein, which began last year. Ms. Suu Kyi – who was released from nearly two decades of house arrest in November 2010 – stated that her party, the National League for Democracy, has repeatedly emphasized the need for rule of law and an end to ethnic conflict in Myanmar. She stressed the need to equip young people with the skills needed to enter the world of work. “Vocational training linked to job creation is imperative if we are to safeguard the future by giving our youth the capacity to handle effectively that responsibility that will inevitably fall to them one day,” she said. In her address to the 101st International Labour Conference, Ms. Suu Kyi also pointed to what she called the years-long association she and the National League for Democracy have had with the ILO. 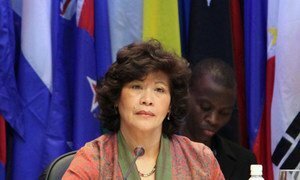 “We cooperated to the best of our ability with the ILO and other interested organizations and individuals over the issue of forced labour and child soldiers,” she said. Yesterday, the Conference lifted its restrictions – in place since 1999 due to concerns over the use of forced labour – on the full participation of Myanmar in its activities, and decided to review the progress on the elimination of forced labour in the country next year. The Government of Myanmar and the ILO have agreed to a joint strategy for eliminating forced labour in the country. The Government acknowledges the need for immediate action on this strategy with a view of implementing it before the target date of 2015. Following her visit to Geneva, Ms. Suu Kyi will travel to Norway, United Kingdom, Ireland and France. Nearly 5,000 government, employer and worker delegates from the ILO’s 183 member states have gathered in Geneva for the Conference, which is focused on the global jobs crisis and its impact on youth, as well as social protection and rights at work. It began on 30 May and ends on 15 June. A top United Nations official called today on the Government of Myanmar to boost partnerships between the private and public sectors to support the country’s recent reforms as well as to help accelerate development and job creation in the country.